Meet Henrick, a two-year-old cat who is patiently waiting for his forever home at the Georgian Triangle Humane Society shelter. 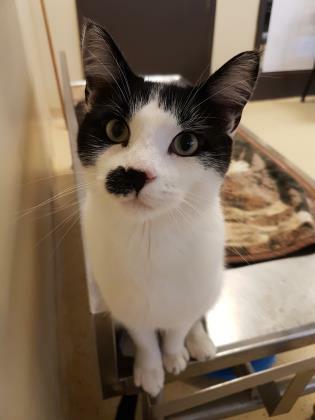 He’s a handsome boy, mostly white with black spots, black ears and a half-moustache that’s super-cute! Henrick is just the right combination of social and independent. And he has the sweetest, funniest little meow you’ve ever heard! He’s always greeting his human friends at the shelter with little squeaks and his own unique meow that will melt your heart. His adoption fee includes neutering, up-to-date vaccinations, parasite treatment, viral test and an ID microchip.